Intimate, beautiful, and tranquil are three ways to describe a yard that has water features incorporated throughout it. 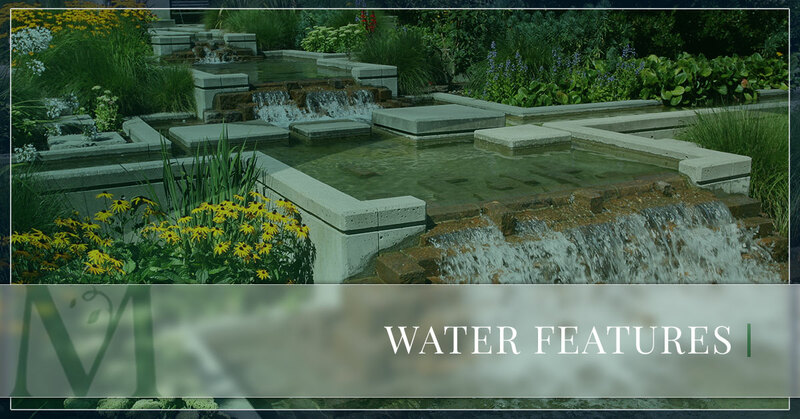 If you want a fantastic visual showpiece or an area to relax by after those long work days, water features will provide you with an outdoor living space that is great for entertaining or just relaxing. If you’d like to incorporate water features in your backyard or even your front one, then contact our Atlanta landscaping services to take advantage of everything we have to offer. Water features can bring a lot to a yard. They’re eye-catching, tranquil, and functional. The sound of water trickling down natural stones and the reverberation of nature in your backyard can create a marriage of elements that are not only enjoyable, but also harmonious. The incorporation of water features will bring nature to your doorstep, even for those houses that are far into the City Of Atlanta. One of the many benefits of water features is that it’ll bring nature to your doorstep and it’ll enhance the ecosystem. With the earth and wildlife changing, you’ll have the opportunity to give back to Mother Nature by adding more to your local ecosystem with a water feature in your yard. Furthermore, no matter how large or small your yard may be, the addition of a water feature can adapt to any type of yard. The size of your yard shouldn’t hold you back from creating an outdoor living space where you can entertain or relax with a nice glass of wine as you listen to the harmonious sounds of nature that surround you. Do you want to add tranquility and nature to your yard? Do you want to enjoy the sounds of water in your backyard as you have a nice supper? Contact us to learn more about water features.